This gentleman assists in the maintenance of law and order in Warren and vicinity, being Police Magistrate and Justice of the Peace. He is also a Notary Public, a Director of the Public Library, and Secretary of the Board. In addition to these various interests he transacts a goodly amount of business as agent of some of the best life and fire insurance companies of the country, besides attending to real-estate transactions, and conducting a trade in agricultural implements. He may usually be found at his headquarters, a well-regulated office on Main street, while his pleasant and attractive home is situated on Water street. Mr. Francisco came to Warren as early as the spring of 1857, when to dignify it by the name of village was to confer upon it an honor which its proportions scarcely justified. He has remained steadily by his first love, watching its growth and development with that interest only felt by the faithful and enterprising citizen. We must not omit to say in this connection, however, that, after the outbreak of the Civil War, he shouldered his musket, enlisting in Company H, 96th Illinois Infantry, Aug. 15, 1862, which was assigned to the reserve corps of Gen. Gordon's granger command in the Army of the Cumberland. He participated in the first battle at Franklin, being with the Fourth Batallion (sic) of Mechanics and Engineers, and thence went to Chickamauga, where he was wounded in the fight three times. Here he signalized himself especially for his courage and prowess, and was recommended for promotion. His wounds, however, disabled him for further service, and he was obliged to accept his honorable discharge. Returning now to Warren Mr. Francisco prosecuted business as a contractor until 1881, then having been elected as police magistrate, entered gradually upon the enterprises to which he has since given his attention. A man of more than ordinary ability he has filled many positions of trust, officiating as Township Clerk three years, and uniformly giving his support to the Republican party. Upon first coming to this place with his father he assisted in the erection as contractor of two of the most prominent brick business blocks, and later put up for himself a residence; besides sixteen other buildings, erecting and selling one after another, all of which were the source of a good profit. Mr. Francisco, a man in the prime of life, and claiming his nativity in the great West, was born at Grass Lake, Mich., Oct. 6, 1840. Four and one-half years later his parents came to this State, locating in McHenry County, whence they removed less than three years later to Rock County, Wis. After a residence of two years there they changed their abode to Madison, Wis., then sojourned again for a time in McHenry County, this State; our subject in the meanwhile completing his education at Warren, in this county. Here he was a student of the college institute conducted by Prof. Martin, of St. Joseph, Mo., and later occupied himself two years in reading law in the office of Thomas E. Champion. His further plans were interrupted by the Civil War; he, in 1862, enlisting in an Illinois regiment, and serving a period of two years. 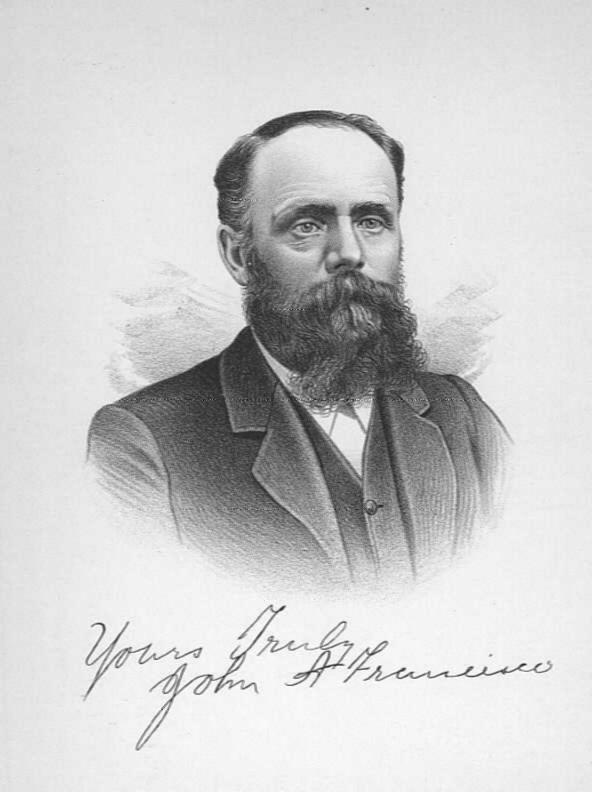 Mr. Francisco, while a resident of Warren, Ill., was married, Dec. 12, 1865, to Miss Sarah A. Smith, of Grass Lake, Mich., and of this union there have been born seven children, one of whom died when three years old. The survivors are: Don P., Grace C., Inez E., Edna, Elsa E., and John H. Mrs. Francisco was born Dec. 4, 1847, in Michigan, and is the daughter of James and Caroline (Currier) Smith, who were natives of New York. The father was a cabinet-maker by trade, which he followed the later years of his life in Grass Lake, and is now deceased. Charles Francisco, the father of our subject, was born in Cattaraugus County, N. Y,, and married Miss Helen M. Clark, of Grass Lake, Mich. His parents left the Empire State when he was a boy, removing to Ohio, where he sojourned until a youth of nineteen years, then emigrated to Jackson County, Mich., where he met his future wife. He secured a tract of unimproved land, from which he constructed a farm, and upon leaving it took up his residence in Grass Lake, where he lived until his removal to McHenry County, Ill., and from there to this county. Here he was one of the pioneer builders and contractors; putting up the first really substantial block about 1857. He spent the last years of his life upon the farm of his son, our subject, near Marengo, and died, about 1863, from injuries received by a fall while engaged in the erection of a church-building. The wife and mother is still living, and makes her home in Wichita, Kan. The elder Francisco was a Republican, politically, and a member in good standing of the Free-Will Baptist Church. Mrs. Helen M. (Clark) Francisco, the mother of our subject, was born at Salina, N. Y., and when quite young removed with her parents to Jackson County, Mich., where she lived until her marriage, which took place when she was only sixteen years old. She became the mother of our subject a year later. The parental family included thirteen children, who are now, with one exception, all living; and of whom our subject, John A., was the eldest of four sons and nine daughters. Among the portraits of well-known and distinguished men appearing in this volume may be found that of Mr. Francisco.